Lord DC would like the icy and desert areas as the region Omnipotencia. Blotz would like to also have influence on the desert area, where they can both build. They never mentioned the jungle. Blotz and Lord DC should probably say what they think of the jungle being a part of it, and then voting when they're ok with the proposal. We worked it out, and blotz said "when the jungle depletes we'll think of something" So please include that in the region. Ok, since you approve of Omnipotencia the Asovel region will be abandoned, because it all becomes a part of Omnipotencia. You can say when you want to start voting for Omnipotencia. You can't vote for your own proposals. i'd like to add an additional clause (does this need a seperate poll) that i control the mining decentral building and a 5m margin around it from bedrock to sky (although, as per an unwritten server rule, lord_dc can still mine and cave under it). Same proposal as before, but with the connected forest included. hmm, who owns the green again? also, imagine the chunk error going horizontal was extended. 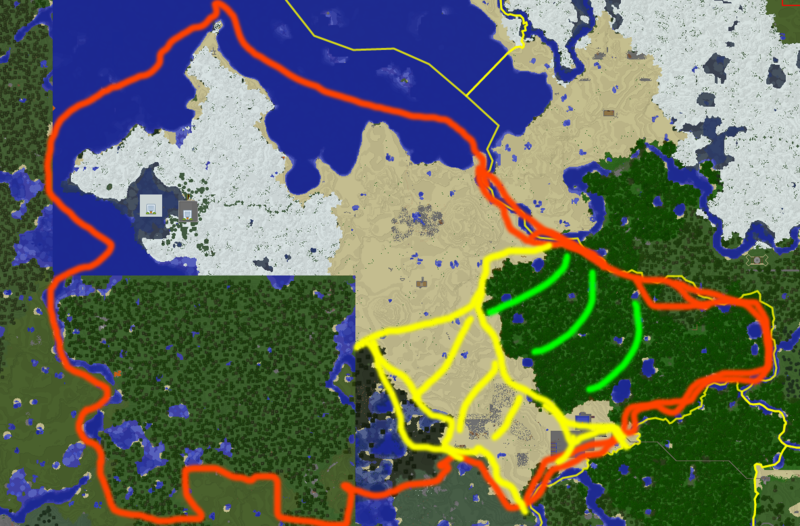 i would like to have my desert region increased to there since 1. i have an outpost there and 2. with my new mob factory i'm going to need a lot more sand for my gunpowder, you can see i've already finished nearly 1/3 of the yellow area. of course, if Lord_DC runs out of sand he can always talk to me and mine there. 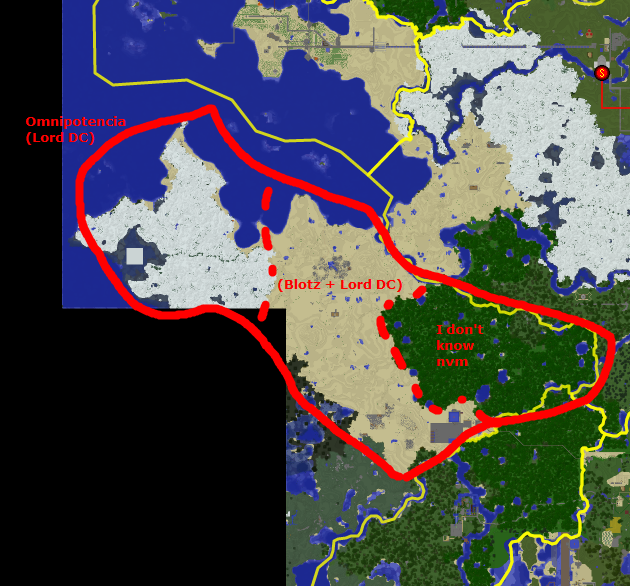 We've begun building the PvP area Trenchland south of the forest. I guess it should be ok, but if you don't need all of the forest, maybe it'd be better to not claim it all, so there's some left for Trenchland. Also Blotz, you don't need to claim a desert to gather sand from it. You could also set up a portal in a far away desert and gather sand there with donkey and enderchest. Ofc it's easier to do closer to your base but it also leaves an ugly environment, but it's your choice. i'd like to add an additional clause (does this need a seperate poll) that i control the mining decentral building and a 5m margin around it from bedrock to sky. go ahead, i wont touch that building anyway. however any of the old caves i run into i wall off with cobbled. I suggest the cyan borders, what do you say? Anyway DC what do you say to the cyan borders? Ok, nobody voted and the proposal has been changed, so let's restart the poll for 7 days.